As of mid-September, graduates of the TMF Physician’s Health Program now have a symbol of their accomplishment: a bronze coin that honors the completion of their time as a participant in the PHP. 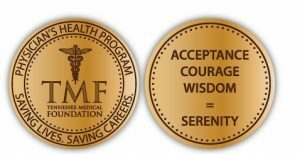 Similar to chips and coins used by Alcoholics Anonymous, the main purpose is to keep PHP graduates motivated to continue their recovery program throughout their lives. The TMF coin includes the Foundation’s logo and motto on one side, and the message “Acceptance, Courage, Wisdom = Serenity” on the opposite side. For more information, contact TMF Field Coordinator Jeanne Breard at 615-467-6411 or jeanneb@e-tmf.org. 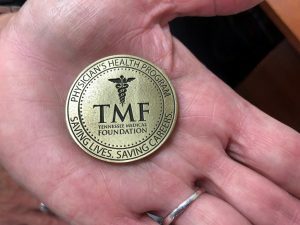 If you or someone you know is struggling, contact the TMF at 615-467-6411 or online at e-tmf.org/contact.